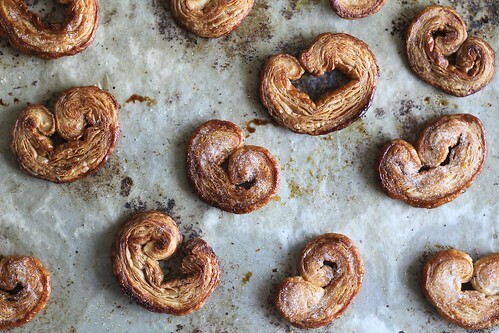 I love your perfectly imperfect palmiers! Half the time I make these (or my students do) they unfurl. If I have the time, I roll the pastry tight and leave it in the fridge for ages before I cut it and I find that helps. But I kinda love this look! Yeah, I probs should have rolled them the night before but just didn’t feel like it! These are a fun and delicious way to use up puff pastry scraps. I know they’re good with coffee but I’ll have to try them with ice cream now. I can just imagine the lovely gentle crunch these beauties make as you bite into them. Yum! Your palmiers look terrific – I think the unfurled ones are half the fun. Everything is good with ice cream and coffee. Looking forward to making these. I love all the puff you got out of your palmers! Mine were a little lean haha!